I wrote a single post on the December regional elections hinting that I may not want to cover further than what I did, silly arithmetic prediction included. But the debacle in the chavistas candidate "nomination" process is so tempting... then again the ongoing slow motion suicide of the opposition keeps apace so why bother covering what may be the final set up of the totalitarian regime of Chavez whose end can only come through open rebellion? Started by chavistas themselves, mind you! Let's start with the chavista mess. I am not an electoral prude but what happened in Venezuela last week is really worrying, almost beyond words. By not being an electoral prude I mean that for political reasons some concessions can be made when someone decides to run for office in a district that it is not the one they live in. You may have been born there, you may live next door to it, your children go to school there, you may have a special connection there for X, Y or Z reason. Thus even if you are not registered there there may be a reason, a valid reason, for you to run there. Entre todos los insultos a la inteligencia a los cuales nos sometió la rectora Socorro Hernández desde el CNE la semana pasada existe un elemento que deja bien, pero bien mal parada a la ex ministra de la presidencia, Érika Farías. No solamente ella aparece en la lista de "migrados" del CNE porque no votaba en el estado al cual la mando Chávez para ganarse la gobernación, pero ademas nos enteramos que pese a ser diputada de Cojedes, la tipa no se ha molestado en quedarse como electora en el estado que ella representa. Retratos de Bolívar por doquier, pero ¿se honra su moralidad? Otra vez tengo que escribirte una carta abierta a la cual no tengo la mas mínima duda no contestarás. Total, a estas alturas está claro que mientras más explicas más cara dura, y ridícula, apareces. El silencio que guardas en general detrás de todas tus travesuras te sirve mejor. Pero tengo que escribirte porque tienes mucha suerte a pesar de todo. En tu debacle de la semana pasada parece que todos se olvidaron de tus travesuras en el 2010 cuando se la clavaste bien feo a la oposición robando por lo menos 6 diputados a través de tus trampas electorales. Yo no me olvidé. ¡Chica! Es que eres una experta, una robo-lucionaria a carta cabal. El día que me visites tendré que esconder hasta la billetera. Primero permitanme aclarar mi propia actitud: si bien estoy decepcionado con muchas cosas, NO VOY A DEJAR DE VOTAR. Dejar de votar es una estupidez. Punto. Last night I stumbled on a post published December 29 2008. At the time I thought it worth a translation on December 30. That post was an end of year introspection, in between the results of the regional elections which negative results Chavez was busy undoing while campaigning hard for the eternal election amendment about to be voted on in February. Needless to say that the lack of response of the opposition then was rather debilitating as it seems the confused reply of the MUD and Capriles himself to the obvious electoral fraud is going to cost. Though I could add that many opposition politicians were actually not opposed to the amendment as they thought it would benefit them too. Look at the recent Ojeda-Paraqueima scandals and you will know that Venezuela has a particularly sorry lot of politicos. Having seen the main political consequences of the October 7 result, we may indulge in a little bit of forecasting. There is a crisis coming and it is unavoidable. The only way the crisis impact could be softened is if chavismo accepted to recognize the existence of the opposition and a return to a more democratic state, by relinquishing at lease a couple of the 5 powers that it currently hold in a tight fisted hand. Once the opposition understands that its basic civil , and human, rights will be respected, only then the regime will become a government again and co-opt the opposition into taking the hard measures that cannot be avoided any longer. But Chavez been the scorpion to the swimming toad, such concessions simply will not occur as he is alive. No NEP for the Narcissistic-Leninist regime. Thus an economical and political crisis is in the works, with a scenario like the one described below. Properly this post should not be included in this series but since the December result will impinge on some of the stuff discussed earlier, it is best to put it here. In two parts, that is: one part about the importance of the election and the second part as the only prediction I will do on that matter. Unfortunately I do not see it happening. Below I describe the most optimist scenario I could come up with. Let's summarize the situation: the Unidad and Capriles run an excellent campaign and were prepared as ever. And yet they lost. What makes this result worst is that it seems that as long as Chavez will be directly on the ballot the opposition will never win an election. It was a defeat. We may want to pretty it up, it will remain a defeat and lessons must be taken no matter how harsh these maybe. Because if we keep the way we are, no matter what leaders say, from Petkoff to Capriles, in December we will win few, if any states. And if we cannot retain Zulia and Miranda, even if Chavez croaks soon, chavismo will remain. Una lectora me manda un articulo publicado en Le Monde, el periódico de referencia en Francia, y nunca muy amigo de las derechas que digamos (Le Figaro es para estas). Pues bien, el autor de este articulo de opinión es un tal Marc Saint-Upéry, y pertenece al electorado del "Front de Gauche", Frente de Izquierdas, a la izquierda del partido socialista francés, partido que hoy en día posee la presidencia y el parlamento francés. Este artículo esta escrito por alguien de izquierda de verdad, verdad. Pero eso si, una izquierda que todavía comparte valores democráticos aunque a veces algo cuestionables, no como esa izquierda fascista y chambona del PSUV. Antes de pasar a este articulo me permito recordar al lector sobre unos cuantos emisarios enviados por el Front de Gauche para ayudar a la reciente campaña para la reelección de Chávez. Obviamente queda claro que hay diferencias muy importantes dentro del Front de Gauche con respecto a Chávez. Quien tienen ojos, vé. La traducción del articulo que me mando A.D. sigue. Henrique Capriles has decided to run again for Miranda state. As such he deserves an entry of his own in this series because it is an opportunity to discuss the nature of the opposition voter. Capriles was elected in 2008 governor of Miranda state. On October 7 he added almost 200,000 votes to his 2008 result but still lost the state. Chavez managed to add 76K votes over his 2006 score and barely won. But he won. Yes, Chavez won, but with a victory that is not as glamorous as he was needing. In short, he had to buy at lest 10% of the electorate which means only one thing: they love you for your money. Also, he went as far as starting to sell the gold of intentional reserves so the campaign overall cost a fortune. And today he admitted that he is not the same, that he was inconvenienced during the campaign (I suppose that in his mind it means that it justified vote buying since he could not go and meet voters). So there you have it, a Chavez sick, not truly popular and with money issues. Without forgetting that behind him there is a crowd of hanger-on with financial appetites bigger than ever. Had Chavez won with 60% I am certain that right now we would be talking referendum for a constitutional assembly, or at least a major reform of the constitutions. The people behind Chavez are the first ones to realize that if all the abuses committed during these past 6 years Chavez only gets 55% of the vote, once he is dead they are toast. Now it is not a matter of preparing a soon to come succession, it is a matter of making sure that chavismo never leaves office. Fortunately this post is short because I just need to redirect you to a great article of Moisés Naím in El País of Spain. Spanish version here and English version there. This article is remarkable not for its style, it is a list, nor for its writing, it is a list, but for the precision, concision and the "to the point-ness" you sense when you read it. Clearly Mr. Naím is past any illusion as to the future of Venezuela and what is actually scary in his article is that there is nothing that you can nitpick. What I would like to underline is the last paragraph where Mr. Naím puts clearly part of the blame for the situation on Brazil who had no qualms in letting Venezuela deteriorate as long as it became its bigger provider of everything. I will add that Brazil has behaved towards Venezuela as any imperial colonial power had, using the weakness of the natives for its own selfish benefit. It is remarkable, for me at least, that such a notable intellectual from the center left in all of its modern meaning takes down Lula AND Rousseff the way he does, just after a campaign where Capriles failed even though they tried to embrace Brazil current model if it were the last life jacket available. Now that we have gone through all the electoral analysis that was needed, it is time to measure the consequences for Venezuela of Sunday 7 result. What country are we left with? What can the opposition do? What are chavismo next steps? What if...? What about...? I think we may as well start with the social consequence for the country since we will all suffer from that. We keep playing the democratic game, we keep improving ourselves, we keep finding adequate retorts to the treachery of chavismo and yet we keep falling on our faces because chavismo is reckless in its pursuit to retain power at all cost and creates ever more outrageous ways to cheat for which not only we are not prepared, but for which, after Sunday 7, we may never be able to get prepared. It is clear now that there were a lot of people that voted under duress. They were scared to find out at 3 PM that that the chavista electoral steam roller knew they had not voted yet. They got scared when they were hauled unto a van with other people that had not voted yet and were also found out. They were scared when they arrived at the voting center and saw strange machines and realized the privacy of vote was compromised. And thus they truly thought that chavismo would know whether they voted for Chavez or not. This is, I hope, the one before last of this series. After having looked at some of the details that allow us to understand the enormity of what happened last October 7, we are, I hope, more prepared to consider the bigger picture. I know, it is kind of taking things in reverse order, but sometimes it pays to look at details from the periphery before tacking the big problem. I did it all the time when I used to be a researcher. Yesterday and Sunday there were a few OpEd on what went wrong in the Capriles campaign. Some go as far as putting some of the blame on Capriles which I think is somewhat unfair since the organization asked him to campaign while they took care of everything else. As far as I am concerned, even though I did not agree with some of the improvisations Capriles did, I will say that he did the best he could, which is more than what can be said for a lot of people inside the Unidad. Two of these pieces are going to be enough to show you that the aggiornamento of the opposition ain't gonna happen any time soon. I do not have major quips with Carlos Blanco Sunday piece. However there is a part that raised my eyebrows. A deeper issue which has reared in the post electoral hangover is the profoundly reactionary and misguided notion that chavistas are assholes who sell for three thousand bolivars. It is not noticed that the politicization of the poor, the creation of a new elite, even the existence of a chavismo of suit and tie, are part of a new social and political reality. 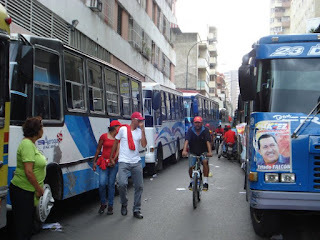 Insulting Nicolas Maduro because he was Metrobus driver and then became Foreign Minister is to fail to understand that in a real democracy, it is to be wished for that drivers of whatever can reach the highest positions. That's what AD did in its time and, say, a humble cobbler such as Augusto Malave Villalba, not gifted for oratory, who became a major union leader and politician, was teased likewise. Blogger keeps offering more services. Thus a new comment policy. Creo que los gringos inventaron esa tradición de la "luna de miel" política, ese tiempo que se le da a un político recién electo para que tome sus primeros pasos sin ser juzgado con severidad. Obviamente, políticos reelectos no tienen tal beneficio aunque por lo menos se les permite unos días para saborear su nuevo triunfo. Ni siquiera esto está pasando hoy en Venezuela y no es culpa de la oposición: con sus primeros nombramientos al gabinete no solamente Chávez nos reta, pero da al traste con cualquiera buena intención que habría de parte de la oposición no para un dialogo pero, digamos, para un chat, aunque sea por Facebook. The totalitarian moment of the week comes to you courtesy of the Guardian. Argentine journalist Lanata was detained and harassed at Caracas airport, threatened, and finally released but with his cell phone and computer banks all erased. The reason? among other things he was in possession of SEBIN documents that detailed the illegal spying that the regime did of Capriles, his family and close collaborators during the campaign. The situation about privacy rights has become so bad in Venezuela that Capriles told us that he does not even own a cell phone because he does not want his private conversations broadcast at night in La Hojilla. any communication with Caprles had to go through one of his collaborators. There is outright electoral fraud and there is indirect electoral fraud. However, which one is the most effective depends on the situation. The big difference between the forms of electoral fraud is that the direct electoral fraud is usually cheaper, you just need to stuff the ballot box with the desired count. However, when found out, the consequences may be harsh for the cheating side. On the other hand indirect fraud is considerably more expensive but it has the advantage that when everything is said and done those who sold their vote for any or other reason, did vote for the winner in the end. El Universal today carries some interesting information showing that both forms of fraud were at play one week ago. UPDATED In Venezuela there is that long running tradition that no matter how insignificant your political movement is you still want it to appear in the ballot box, hoping that with 0,2% of the votes cast you will be able to demonstrate that without your help the winner would not be so. 14 years of Chavez have not dented that deleterious habit, not even inside the chavista hegemony where Chavez has given up for the time being to preside over a unique party outside of any coalition. In fact Chavez has started stealing away other people's political party to refurbish a coalition of the naive. Let's look at the mosaic of political groups. Two results did surprise me a lot and made me think about leadership qualities and how careless are voters in Venezuela. Not that this last one was a surprise.... Whatever you may think, it led me to think about the future of Capriles as a leader of the opposition that many are going to hate me for. We need to face it, to look at Chavez numbers. Luckily I found a way to make it less painful. En senda rueda de prensa el Presidente del PSUV, Don Diosdado Cabello, anuncio los esperados resultados de la primarias del PSUV para cargos a gobernador a disputarse con los majunches electos en sus primarias el mes de febrero, que todos sabemos fueron manipuladas y con una falta de tramparencia total. No dejó de sorprender a la prensa invitada lo acertado de las decisiones soberanas de los 10 millones de miembros del PSUV en esta gloriosa jornada democrática electoral del PSUV, asombrosa por su eficiencia y rapidez. Enough of you seem to have forgiven me. And so let's get started with the Sunday results. And what better place than to start with Caucagüita which has been a long running monitor in this blog, the latest entry being when I started getting ready for the 2012 speculations. Not only it will serve as the best way to understand what happened last Sunday but it will also serve as a detailed explanation while so many people got it all wrong last Sunday. We will start with a summary table. The CNE is accused of a lot of things so for once I decided to go back on my data to include even the null votes. And it is interesting even if it does not give a smoking gun to blame the CNE for the evils that we, the opposition, suffer. Una lectora de Florida, Luisa Ramos, ha hecho un magnifico trabajo en traducir el texto que compuse en la noche del 7 de octubre y que llegó hasta las columnas de un conocido periodico. Solo tuve que hacer unos muy menores ajustes porque es verdad que mi pensamiento es a veces algo toruoso, lo que le da aun mas meritos a Luisa. Aquí lo tienen en castellano, para su disfrute y para los amigos que no lean en inglés. El fraude estaba montado en el mismo tarjetón, con todas las tarjetas de Chávez arriba. Por lo tanto para votar para Chávez había que inclinarse algo hacia adelante y con los parabanes demasiados bajos eso se podía ver muy fácil. Certainly before I write anything analytic on Sunday's numbers I need to make my mea culpa if I want to rescue any shred of credibility I may have left. Thanks to WSJ columnist Bret Stephens for appreciating what little contribution this blog may offer. Hat tip Juan Cristobal. Article posted here for those with no access to the WSJ, in case the above link does not work. I remember when I arrived to the US, decades ago to do my MS-PhD, I met several Iranians. They were reasonably fresh from leaving their country, maybe a year or two before the Ayatollahs took over, maybe a year or two after. It did not matter, they all shared two things, a cosmopolitan worldly view of the world and a deep reluctance to talk about their country besides the ritual “yes, it is bad”, “we still have family there” and the ever coming “No, I think that I am staying here because, you know, an US degree is more marketable here than there”. Clearly, none of them wanted to get into details, none wanted to admit that they were never returning home. Tonight out of the blue I recalled some of these scenes, when I chose to walk my dog for her midnight pee rather than listen to the high pinched, almost bratty voice of Tibisay. What for? Whatever edge Chavez had, I would read it on tweeter as soon as I plugged back in. While I was working at the Election Day coverage I was urged to write about what would happen to this blog depending on the result. I really wanted to do it before the results came, thus in a hurry this afternoon I wrote that post. Now in hindsight I realize that deep inside me I knew what was going to happen, how for all appearances something was missing. That is what pushed me to write so crudely about what I would do if Chavez were to win, because I knew deep down that there was that possibility. And it was walking my dog in the cooler night air, with all of my neighbors inside in silence while from downtown the fireworks were starting, that I went back to my Iran friends from long, long ago. I am not going to keep blogging as I have been doing because like them, I am ashamed of my country. I understand that now, why they always tried to avoid talking about their country and why they tried so hard to become as American as they could get away with. They were embarrassed that their kinsmen had surrendered to an obscurantist cult, a return to the middle ages, or whatever passes as middle age obscurantism in Iran’s history. I am certainly upset and somewhat depressed at Chavez victory. But to tell you the real truth, I am strangely relieved because a few decisions have been made for me and now I just need to refocus my life. To understand this you need to recall that I am a scientist and that no matter how hard it is for us, there is no such a thing as bad data. Data is data, period. It is up to one to figure out its true implication. When I predicted a Capriles victory by 500K, refusing, note, to get carried away by those who said 1 million or more, starting by Capriles himself, I never forgot to mention that abstention was the key, if not of victory at least on the margin of victory. My mistake in the end was to see that abstention was not going to be that high and then fooling myself into the capacity of Capriles to peel out directly votes away from Chavez as compensation. It did not happen, half of the people that abstained in 2007 and 2010 went back to chavismo in what we are told is the biggest turnout in a couple of decades. During the day I was seeing all of these people voting, and the first reports of the mini CNE here did indeed worry me although I never let it show, though I resisted the natural urge of exit polls, remembering how those flopped in 2004. The lack of abstention propelled Chavez to his third term. It is thus necessary to look at the data and interpret it. The people who reelected Chavez today know exactly what they voted for. They know about crime and violence. They know about inflation and scarcity. They know about vulgarity as a way of life. They know about political prisoners while the most corrupt cast of our history roams the streets free. They know about power outages that will never be solved, about public services getting worse everyday, starting with the vaunted governmental misiones. So, why did they vote for Chavez? For a free washer? For the promise of a cheap and low quality housing for which they will not have good utilities and no job to keep it up? People who voted for Chavez voted for him because of Capriles (it would have been the same with Leopoldo Lopez and even Pablo Perez for that matter). They voted against Capriles because they were reminded that education matters, that to get ahead in life you needed to improve yourself, respect some rules, respect thy neighbor. And they cannot do so or are unwilling to do so, same difference in my book. Chavez in 14 years has transformed into virtue what were the vices of Venezuelan society and thus, as I wrote more than once, Chavez was the true conservative, reactionary, candidate that you vote for because you are afraid of change. People vote for Chavez because even if they have no running water or electricity, they feel good about themselves because the president of the country is as flawed as they are, and in the mean version of flawed. He is the one that will insure that you may remain a sinvergüenza. Chavez did not create them, they existed already when he became president. He just reinforced their beliefs in a worthy self loathing transformed into a weird arrogance: el resentimiento social. That is why invasiones are OK as long as they do not happen with your property. That is why you put up with the harsh life conditions we suffer now because whenever you feel like abusing society you need not feel guilty about it. True, not all chavistas are like that and some still, for some strange reason, believe that their salvation will only come from the state. But every day more and more are becoming resentidos. The harsh fact we are facing now, with a result so clear of 54% out of 80% voting, is that 43% of Venezuelans hate people like me. Maybe not to the point of killing me but to the point of trying to screw me in any which way they can. And many of them indeed have no problem to kill me if given a chance. Now in Venezuela you will have all the trouble in the world to manage employees, to be served according to what you are willing to pay for, to demand that public servant do the job they are appointed to do. Because if you feel that you have rights then they will see this as a direct impingement on their comfort. Do you want me to keep writing about such people? When I started writing this blog in December 2002 the world thought that Chavez was the real thing. Now, outside of fringe creeps, the whole world knows that Chavez is a thug. I like to think that I contributed to this greatly. After all, in a mere three years I went from obscure blogger to writing a piece for the BBC for the presidential election of 2006 where I hinted at all that was going to happen in front of Chavez imminent reelection. Then came the 2009 referendum and I never quite recovered, my blogging changed to a certain bitter self indulgence, heralding the inevitable outcome of today. Now outside they know that after 6 disastrous years Chavez still managed to be reelected as if nothing. Their question now is going to become why that is possible. We are a country entering international ridicule. And I want no part of it; I am too embarrassed to explain that 40% of the people that live around me are sinvergüenzas and that most of the 60% else are rather spineless. I cannot justify that I am still hanging out with them. Just as my Iranian friends were embarrassed that women at home gladly wore back the Chador just to make a point, even if it demeaned them immensely. They may regret it today but it is too late as it will be too late for that chunk of maybe 10% of the electorate that may have voted for chavismo for fear of losing their job or some other cowardly excuse. They are doomed to a mental Chador and they do not know it. To finish this I do not want to put any blame on Capriles. He believed in what he did and he did it well, too well surely. His problem was that with most politicians of Venezuela they did not have the courage to lose an election based on true principles, to force the sinvergüenzas to vote for Chavez in full knowledge of the situation. Instead they pretended that by promising a better chavismo, a Brazilian Lulaesque approach, they would convince people. As I anticipated already in the primaries discussions, they failed because when everything is said a sinvergüenza is not going to try an ersatz when he already has the real thing. Need I remind you that I voted for Maria Corina Machado in February? Sure enough she would have done less well than Capriles, much less maybe, but at least she would have educated the people, forced them to consider the real option to get us out of our mediocrity. People would have known of a true different project so at least when chavismo fails, as it will do sooner or later, cancer or not, all such regimes meet their demise, people would have a clear idea on where to go, what the option is, even if they do not care much for that option. Now, after the Capriles' campaign the country as a whole thinks that chavismo light or hard are the only valid options and thus our agony will be unnecessarily prolonged, even if Chavez were to croak tomorrow. Once again, we have missed our option to a real education. Along those lines if there is one thing where I truly failed is to let the absolute need to get rid of Chavez force me to go along and pretend to agree with at least some parts of the MUD proposals. I am not going to stop writing on what will happen next in Venezuela, not immediately. I will continue to blog for a while, trying to reach December with electoral analysis, scenarios and what not because like any good experiment a scientist makes, he writes a paper about it even if he is going to change his research interest. In December the blog will reach its ten years mark so I am aiming at that. But when January rolls in things will be different. I do not know yet what it will be for sure, but one of the goals will be to create a more private and civilized sphere, away from the chavismo mental lumpen. A private refuge for those who want to discuss literature, history, art, music, tourism, related to Venezuela, perhaps. Political articles about Latin America instead? Too much blogging over the years has delayed too much reading and it has to stop. I need to refresh my mind. To survive the next years in Venezuela, there is a need for a classy place where few are welcome. As a start I have restored the full moderation policy so that as of now I will not have chavistas and assorted anonymous write whatever they feel like writing. Posting in the comment section will be a privilege and too bad if maybe I get zero comment in the end. I am now beyond all of that, beyond blog competition, beyond google analytics who beat all blog records tonight, beyond the possible glory of a black out by CANTV, beyond citation by JVR, beyond interviews, beyond.... And mostly beyond saving those that do not want to be saved. And believe it or not, tonight coexist in me two feelings, depression and relief. The problems of my country are not mine anymore even if I have to suffer from them. Apparently we lost. As I predicted, a high participation favors Chavez. And it was high, very high. I should write my plans for the blog before the result comes in tonight. There are two scenarios, one with a sub scenario. The bad news is that I will stay at home passing on the possibility of being in the Caracas excitement and even get an accreditation as a "foreign corespondent" to hang out with some of these journalists and assorted who have covered rather not well the election and see their faces when Capriles wins as this humble blogger writes since August. Yes, I am that confident. 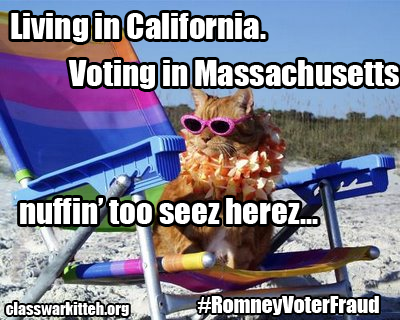 Although I may have enough voting centers for my coverage I really would like to have a half dozen more. I have nothing in Zulia, The Andes or Bolivar. And I have readers there....... You can send them as late as tomorrow 11 AM. The first poll, reserved to those voting in the election (I hope you respected that) went well and is still up, I have added another poll for all, voting or not. Enjoy. Except that this time he was flabbergasted. At least that inspired him to make more pictures than last time, even if at times somewhat off color to downright upsetting. Escabrosa is the word he used. As you may recall, he went last Sunday to see Capriles while yesterday was a mandatory business trip to see Chavez. The fate of so many public employees who did not enjoy at all their day in the rain, in the trash, in chaos. As always, click to enlarge. The first picture had to be the talk of the day, buses everywhere, blocking whole street where they parked, for hours, submerging the city in chaos. Although not yet a rousing success the offers received are interesting enough that I am launching the operation anyway. That is, I have several tables in the 50-50 zone to make any early result we may get meaningful. So, if you are in a voting station or if you know people that are in a voting station and are willing to communicate to you the results of their tables and anecdotes during election day, please, get in touch with me to add you to the project danielinyaracuy (at) gmail . com. "applications" are received until Saturday afternoon. Get moving! I could not go to Barquisimeto today and even if I missed an intense moment it is also true that the TV show is not to be missed. Heck, Chavez in Caracas could not fill today Bolivar avenue in spite of forcing employees to attend. At least he got a pity rain from heaven to serve as an excuse. The Venezuela avenue of Barquisimeto is wider by two lanes and bigger side walks, and longer. Not only he filled up half of it, but the stand is placed in front of the cathedral which offers plenty of open spaces around that he also filled up with crowds. This the biggest venue in Venezuela. But the symbols do not stop at religious marian statements. Not only Capriles is there shoulder to shoulder with the biggest religious crowds of South America, but he is in a chavista ex stronghold, a place where never anyone would have thought it possible for an opposition candidate to have such a reach. Tonight success of Capriles is the starkest evidence at how badly chavismo has screwed up. 4 years ago Henry Falcon was elected with a major landslide. Today, he is offering Lara to Capriles by at least a 10 point margin (and after tonight I am willing to raise this to 15). The litany of the sabotage that chavismo did to Falcon is besides the point now: the night pictures of Barquisimeto are the price paid. The delirious crowds that welcomed Capriles arrival on stage can only mean one thing: his coronation has started. I do not know guys, I am a caraqueño transplant to Yaracuy but the spectacle of Maracaibo has unjaded more than one. 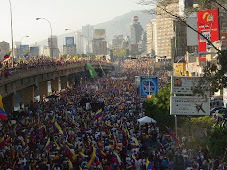 The Venezuelan campaign of 2012 will be for the history books before we know the results. Beyond opinion polls and considerations of momentum, at this late in the game all is possible, from Capriles winning by a mini landslide to Chavez becoming, with all of his aging bloatedness, the come back kid. How is that possible? First, it is not an exit poll, it is just a scheme to get some data before the CNE speaks. That way we can get busy while waiting and already publish our own results AFTER 6 PM so as not to break any major rule and not getting anyone into trouble. This being said, the bad news is that so far I got 4 embassies and only three centers in Venezuela. What to do? First, let me tell you that if ANY political party in the world were to to support Capriles political activities the way the "Front de Gauche" is supporting chavismo, we would hear screams up high in the skies (and see a few expulsions probably). Are we talking about the same country? Really... as if pandemonium could still not happen until next Sunday [deep sigh]. But here they are, my last predictions if possible, where I give Capriles 540,000 more votes than Chavez. That means that with a 25% abstention Capriles would get around 7.3 million votes to Chavez 6.7 million. In percentage that would be 51,4% to Chavez 47,6% and the rest to minor guys. My S.O. reported in very late last night but it was worth it. I am not including his pics in the previous post because 1) he did manage to get on Bolivar Avenue which was not possible for other readers, and 2) he did, as instructed, a more complete report Also, as a public employee he has already been told to show up at Chavez closing rally or else, and thus this blog will publish those pictures too. Click to enlarge. Enjoy!